-The Devils begin the week 5-0-0-1, 11 points, 1st place in Northeast Division (and first in Eastern Conference). -Reid Boucher became the first to be recalled on Monday, going up when Martin Havlat was placed on injured reserve and Mike Cammalleri was sidelined with a possible jaw injury. He appeared in New Jersey’s 8-3 loss to the Penguins Tuesday night in Pittsburgh. -With Boucher and Kelly Zajac (injured) out, Stefan Matteau and Graham Black (who made his lone appearance in the season opener) return to the lineup. -The Devils won 3 of 8 against the Falcons, the two time defending Northeast Division champions, last season. -Springfield comes in on a modest two game winning streak after home victories against Norfolk and Syracuse over the weekend. -Local ties: Former Devil Mike Hoeffel is on the roster, but has not appeared since scoring a goal on October 11th against the Crunch. -This game was originally scheduled for Tuesday, December 2nd, but a Bob Seger/J. Geils Band concert bumped it up to tonight. Season Series: Tied at 1. -The Sound Tigers are coming off a split with the IceCaps in St. John’s over the weekend, losing an extended shootout on Saturday and a 2 goal win on Sunday. -Albany took 3 out of 4 against the Pirates last season. -Portland is coming off a 1-2 weekend, bookending a win on home ice against the Crunch with two losses in Manchester and Worcester. They return to Massachusetts tonight to face the Sharks before hosting St. John’s on Halloween night. -Local ties: Former Lowell/Albany goaltender Mike McKenna is 1-4 so far in his second tour of duty with the Pirates (he previously played in Maine during the 2007-08 season). -It appears Albany fans may get to see former Penguin/Coyote Paul Bissonnette in a Pirate uniform, as he signed a PTO on Monday. More on the Facebook page! Week 3 Recap: Greetings from the Penthouse! An undefeated week in the books…and currently first in the Eastern Conference, with a brief few minutes as first in the league. Offense galore, a few fisticuffs, and some good plays all mixed in. It’s a happy recap this week! A rare Tuesday night start, as the Devils welcomed the Penguins to Albany for the first time since 2012 (both home matchups were in Atlantic City last season). 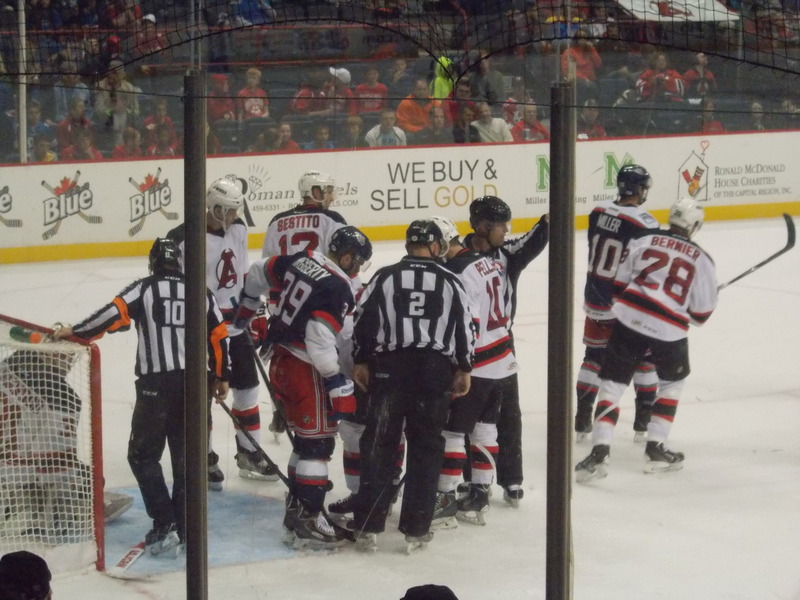 After a chippy first period that saw more fights (2) than goals (0), Albany would get on the board in the second. Mike Sislo would score on an early power play for a 1-0 advantage. He would come through again later in the period, on another man advantage, to double the lead. Things would remain quiet till late in the third, when a Tim Sestito empty netter would seal the win, then the main event broke out as two fights went off simultaneously, costing one Devil a game (more on that in a minute). 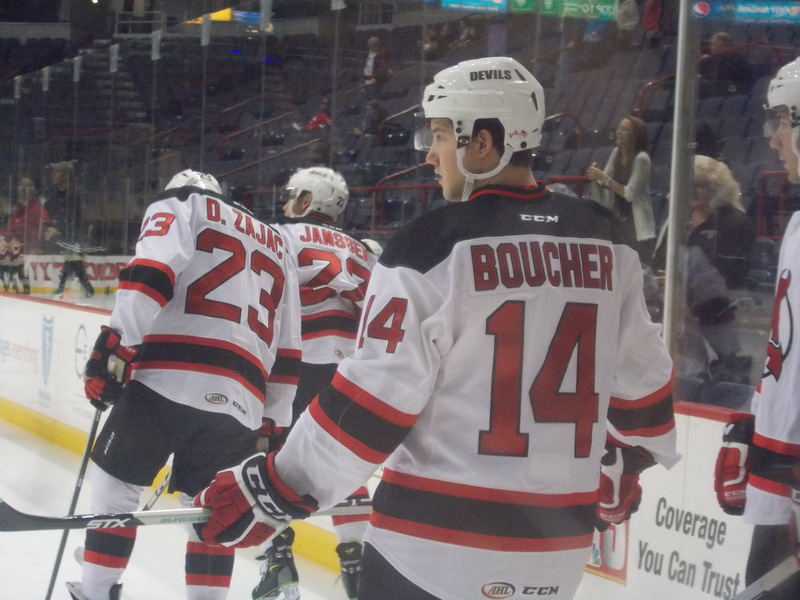 Reid Boucher would add his first goal of the season just after everything settled down, just for good measure. 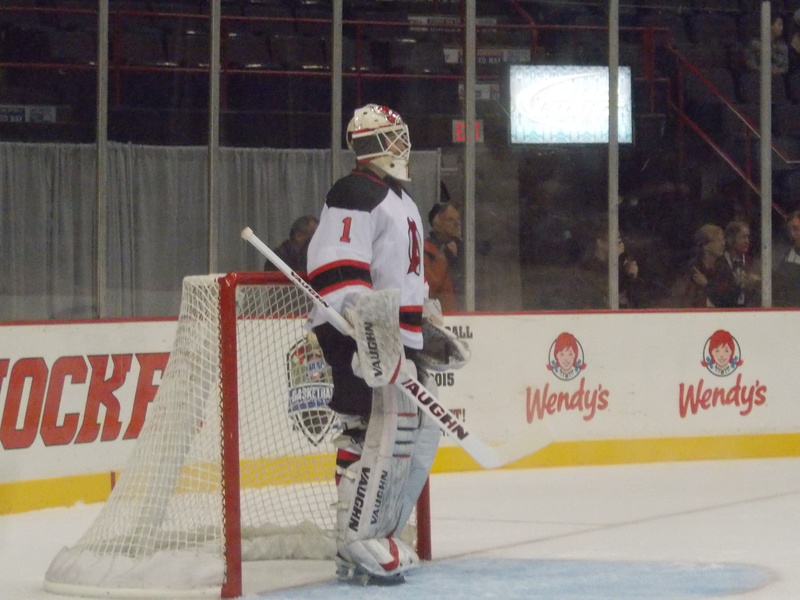 Keith Kinkaid would stop all 22 Penguin shots in picking up his first shutout of the season and 10th of his career, tying for the Albany/Lowell Devil franchise lead with Jeff Frazee. Four Devils would each contribute one assist. Wednesday: For his role in a late third period fight and earning an instigator minor as a result, Darcy Zajac was suspended one game by the AHL and sat out Friday night’s game in Hartford. Friday: The first of the extra players has found a home, as forward Myles Bell was reassigned to Evansville of the ECHL. He had yet to crack the lineup, but did appear during the preseason. The Devils remain the only team in the AHL without an official ECHL affiliation. 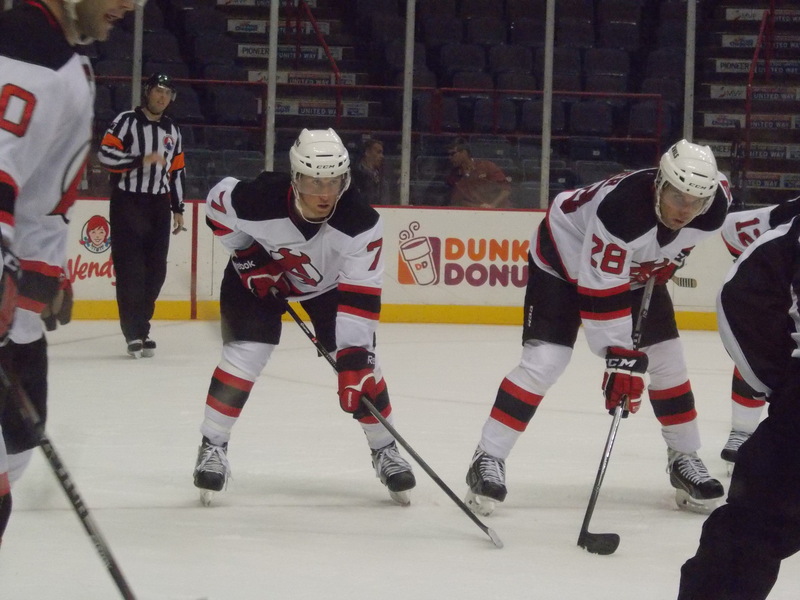 It was back east to Connecticut on Friday evening as the Devils started a home and home set with the Wolfpack. Ben Johnson and David Wohlberg would make their season debuts, filling in for Cam Janssen (injured) and Darcy Zajac (suspended). Rookie Ben Thomson would score his first as a professional (originally credited to Dan Kelly; he would get the primary assist later) 5 minutes in for a 1-0 lead. Marek Hrivik would quickly tie the game with a shorthanded tally. Paul Thompson would break the tie with his league leading 7th goal (also originally credited to Kelly, who would still get a primary assist out of it), only to see Chris Bourque re-tie it over a minute later. Joe Whitney would finally get into the goal column in the second with a power play goal to break the tie yet again. Third period would see the Devils near completely take over the game. Thomson would score his second of the game to double the lead. Scott Timmins would follow just over five minutes later for a 5-2 lead. With Corbin McPherson serving a double minor, J.T. Miller would bring Hartford back to within two with a power play goal of his own. But during the same penalty Mike Sislo would score his third shorthanded for a 6-3 lead, chasing Wolfpack goaltender Jason Missiaen (already following Lundquist’s lead, I see) in favor of rookie Mackenzie Skapski. Sislo would score his second on an empty netter late to finish off the 7-3 win and give the Wolfpack their first regulation loss. Keith Kinkaid stopped 27 of 30 shots in picking up his third win. Four Devils had one assist each, while Kelly and Hrabarenka each finished a +4. Peter Harrold, Timmins and Thompson were all at +3. It was back on home ice to finish off the two game series with the Wolfpack. Scott Wedgewood would get the nod between the pipes, while Jason Missiaen would get a second chance at redemption after being pulled the night before. 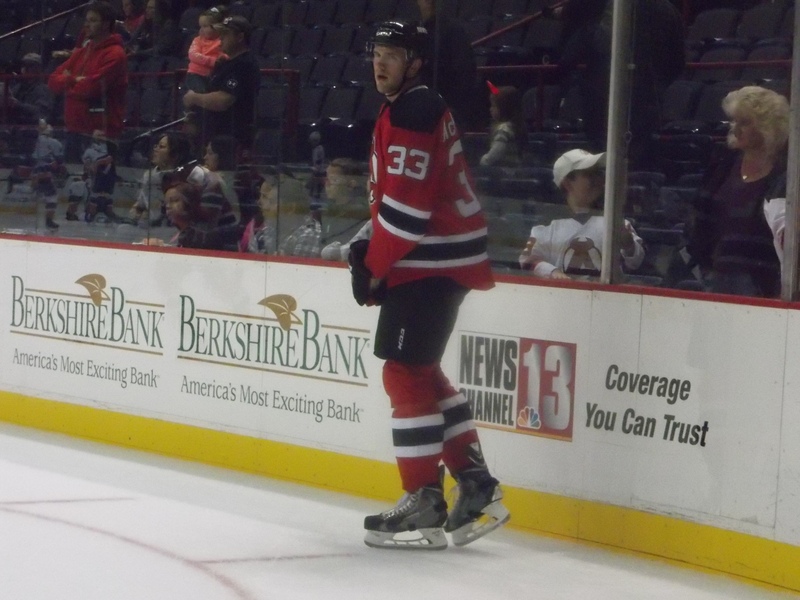 Chris McKelvie would make his season debut, while Darcy Zajac returned after serving his sentence. Unlike the night before, it was Hartford who got going first. The other Bourque, Ryan, would get the visitors on the board midway through the first. Joe Whitney would score his second of the season late in the period to tie it up. But just as quickly, Conor Allen would give Hartford the lead right back. The Devils would take over in the second and never look back. 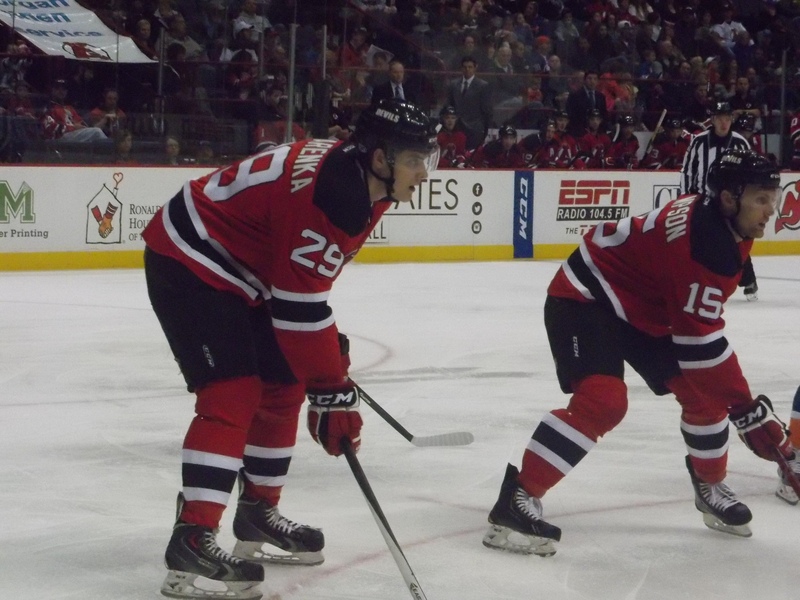 Darcy Zajac would score his first of the season on a beautiful shorthanded break from center ice to tie the game at 2. Just over a minute later, Scott Timmins would score his third to give the home team the lead. Raman Hrabarenka would score on a power play early in the third for a 4-2 lead. Rod Pelley would score an empty netter with less than a minute remaining to cap Albany’s fourth win in a row. Wedgewood had a strong day in net, stopping 26 of 28 shots in picking up his second win (and a #2 star of the game). Brandon Burlon contributed two helpers. Pop Quiz: With Tuesday’s blanking of the Penguins, Keith Kinkaid tied a franchise record with his 10th career shutout. He also owns the Albany AHL mark, going back to the River Rats days. Who is second on the list? Stay tuned for the answer. I had a few nominees to choose from. Unfortunately no video has surfaced yet of any of them. You disappoint me, Internet. Lot of great individual performances this week, but I’m giving the nod to Mike Sislo and his four goals (in three different situations) in two games. The homestand continues with three more games on tap. Wednesday Springfield visits for the first time this season. Saturday sees a return visit from Bridgeport. The weekend finishes with a Sunday afternoon visit from Portland. Pop Quiz Answer: Peter Sidorkiewicz had 8 shutouts during his River Rats career, all coming over a three season stretch between 1995-96 and 1997-98 (he appeared in 15 games during the Rats inaugural 1993-94 season without recording a shutout). Author icepuddlePosted on October 26, 2014 October 26, 2014 Tags ECHL, Game Recap, news and notes, Roster MovesLeave a comment on Week 3 Recap: Greetings from the Penthouse! -This will be the first appearance in Albany for the Penguins since December 12, 2012, a 6-3 Devil win. Both home games last season were in Atlantic City. -The Pens are coming off a weekend sweep of St. John’s in Newfoundland, winning 2-1 in overtime on Friday and 4-1 on Saturday. 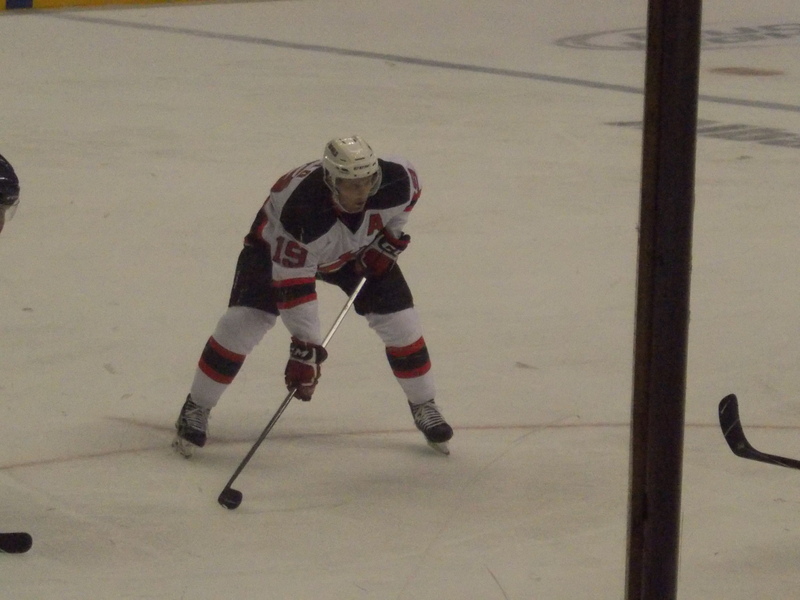 -Two names familiar to New Jersey fans on the roster: captain Tom Kostopoulos, picked up on waivers by the NHL Devils after the conclusion of the 2012-13 lockout and appeared in 15 games; and Pierre-Luc Leblond (known as PL3), who did two separate stints with New Jersey and is one of a handful of players who played for the River Rats as a Devil affiliate and for the A-Devils. 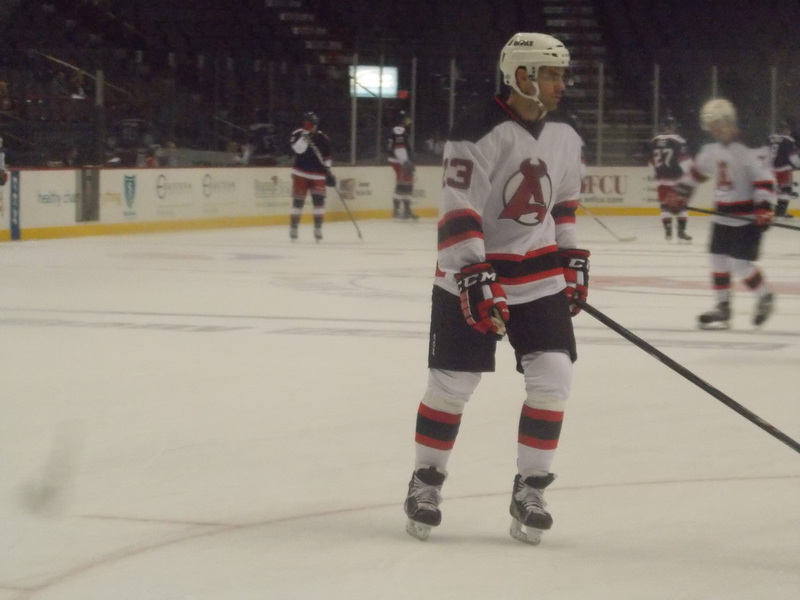 -With 10 games, Hartford ties Bridgeport for the most games against Albany on the schedule. -The Wolfpack are coming off a weekend homestand split, defeating Portland 2-1 on Saturday and losing 1-0 to Hershey in overtime on Sunday. -There is a local tie on the Hartford roster: former RPI forward Ryan Haggerty is in his rookie year after being signed by the Rangers last spring. He scored his first goal as a professional on Saturday against Portland. Extended gallery can be found over on the Facebook page. A little of everything this week for the Devils…seesaw battles on both sides, a sour ending, but then an exciting finish for a 1-0-0-1 record. 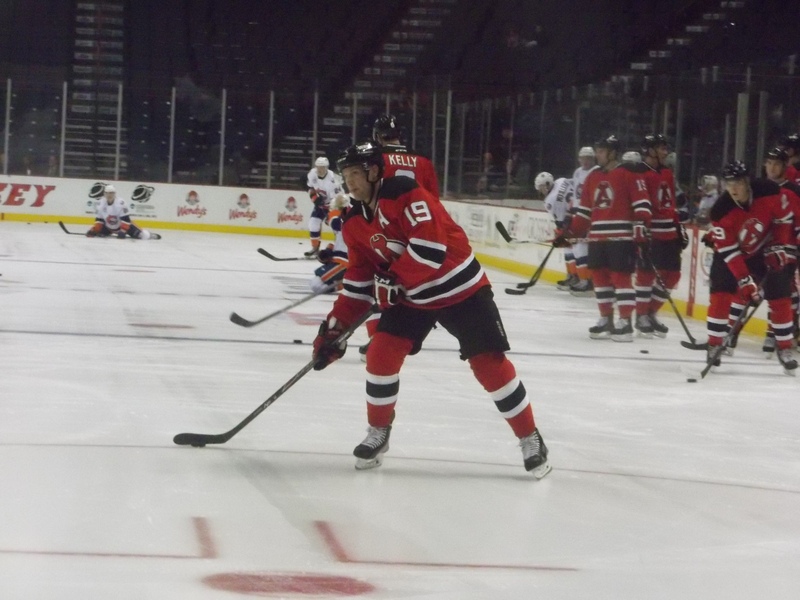 Friday the Devils traveled south to start a weekend home and home series against an opponent they will be seeing quite a bit of during the first half of the season, the Sound Tigers. And things got started in a hurry, as Steve Bernier scored just 21 seconds into the game for a quick 1-0 lead. Johan Sundstrom would tie the game up just as the period was coming to a close. Scott Timmins would take the lead back just 1:34 into the second period with his first goal of the season. Bridgeport would answer with a power play goal by Anders Lee 34 seconds later. Raman Hrabarenka would steal the lead back again with his first of the year 15 seconds later. Of course the Sound Tigers would answer again with another tying goal 6 minutes later. Hrabarenka would respond again with his second of the day on a power play late in the second for a 4-3 Devils game. But in the third, Griffin Reinhart, in his first game with Bridgeport since being sent down by the Islanders, would tie the game again with his first goal. It was on to overtime and the first chance to see the new OT rules in actual game action. Both teams started out 4 on 4, but just before the whistle to signal the start of 3 on 3 action, Paul Thompson would get called for goaltender interference, creating a 4-on-3 advantage for Bridgeport. The Devils survived the kill and made it to the new 3 round shootout. Mike Sislo would score in the first round, but Reid Boucher and Thompson were both denied. 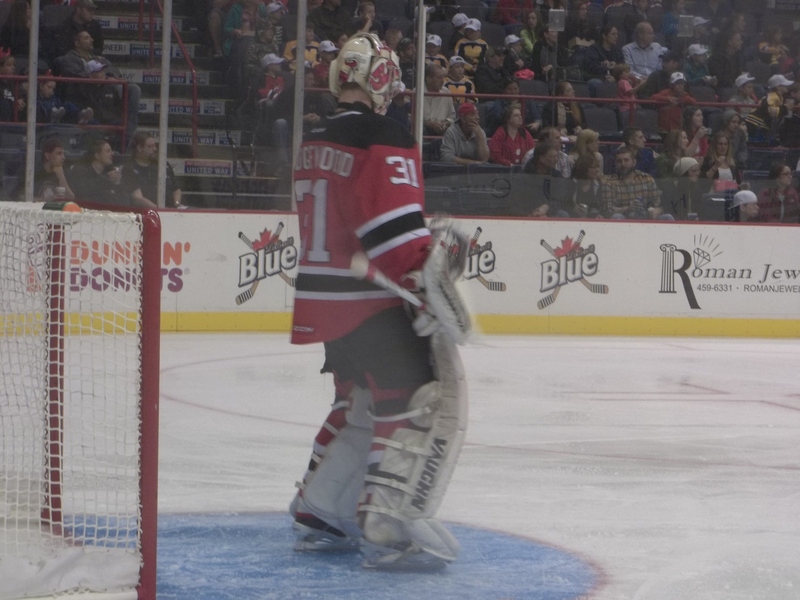 Keith Kinkaid would only stop 1 of 3 Sound Tiger shooters to give the hosts the extra point, something that looked improbable during regulation. The Devils blew leads of 1-0, 2-1, 3-2, and 4-3, survived overtime, but could not come up big in the shootout (sound familiar?). Kinkaid finished with 29 saves (against 33 shots). Five Devils would contribute assists. Sound Tigers TV has the highlight reel. For the first time since round 1 of the playoffs back in late April, it was back on home ice as the Devils tried to put the defeat the night before behind them. Scooter Vaughan would give Bridgeport the lead with under 6 minutes to go in the first period. But like the night before, the home team would respond shortly thereafter. Paul Thompson would score his fifth 2 minutes later to tie things up at 1. John Persson would give the Sound Tigers the 2-1 lead early in the third, but less than two minutes later, a Ben Thomson shot deflected into the Bridgeport net to tie the game at 2. Who actually got credit for the goal? Cam Janssen, who much like his stint in New Jersey last season, just happened to be in the right place at the right time. It was his first AHL goal since March 2013. As the end of regulation neared, Joe Whitney was sent to the box on a very questionable cross checking call, causing the Devils to be shorthanded through the end of the third. But Thompson would come to the rescue, stealing the puck, broke away shorthanded, and scored his second of the night with just 44 seconds remaining in regulation to give Albany the win in their 2014-15 home debut. Scott Wedgewood played well in his first start of the season, picking up the win and stopping 24 of 26 shots. Four Devils each had an assist. Pop Quiz: Who was the last A-Devil to win a game with an overtime goal? Stay tuned for the answer. Seriously, where would this team be without Paul Thompson right now? I had said the first day of training camp that him, Joe Whitney, and Scott Timmins on one line was a good idea. Honorable mention to Raman Hrabarenka for a 2 goal, 2 assist week. Three games on tap this week. Tuesday night the Devils host Wilkes-Barre/Scranton, the Penguins first visit to the Capital Region since the 2012-13 season (both home games last season were in Atlantic City). Friday and Saturday is a home and home–and the first 2 of 10 matchups–against Hartford, Friday night in Connecticut and back on home ice Saturday afternoon. Pop Quiz Answer: Joe Whitney was the last A-Devil to win a game in overtime. It happened way back on January 6, 2012, in Norfolk against the Admirals. Location: Webster Bank Arena, Bridgeport, CT.
-First divisional opponent the Devils will face this season, and one of their most frequent; Bridgeport and Hartford are tied for most matchups this season with 10 each. -Albany finished with a 7-2-0-1 record against Bridgeport in 2013-14. -The Sound Tigers are coming off a weekend split at home against St. John’s, losing 3-2 in their opener on Friday, then rebounding for a 6-3 win on Saturday. -Sound Tigers goalie David Leggio has a local tie…he made one appearance in goal for the River Rats during the 2008-09 season, taking the loss against Wilkes-Barre/Scranton on December 6, 2008. -Saturday afternoon marks the Devils’ home opener, and the beginning of the first community initiative of the season, Cash for Coats.